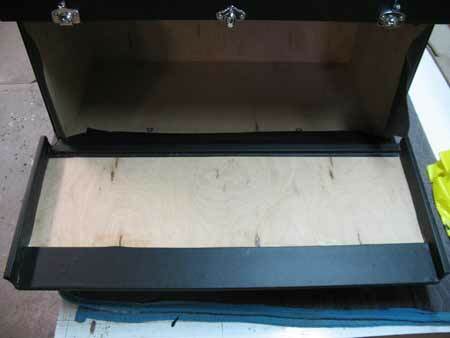 Before covering your project trunk, apply a good sanding sealer. Plan on several coats to ensure the fillers smooth over the flat head screws and seams in the wood so they don't show through the outer covering. 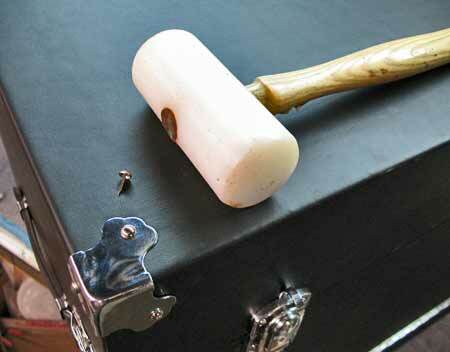 There are several options when covering the trunk. One supplier, Brettuns Village offers thin leather material in assorted colors, grains and thicknesses. 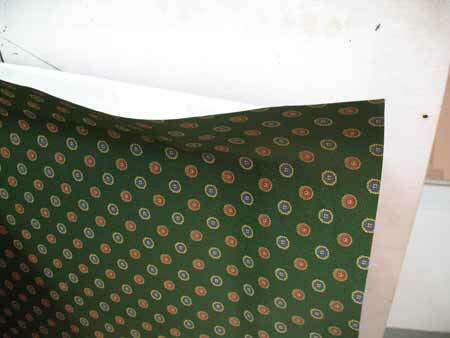 Or you could consider using book binding covering material from suppliers such as Gane Brothers. The book binding material is rather thin, has the appearance of leather, and wraps & folds well onto corners and mates well to overlapped surfaces. Design your seam points so they are concealed in rear areas such as under the vent channels or strips. If possible, obtain swatches of the material so you can assess how well the material can be applied. 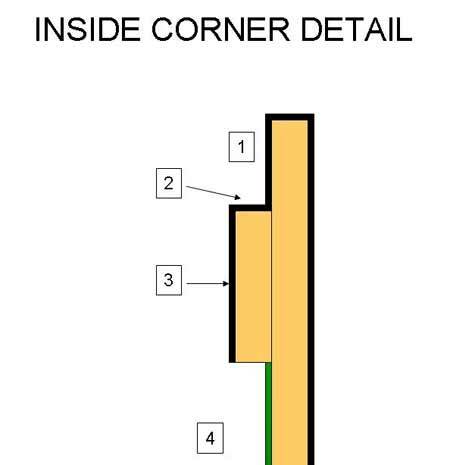 This is especially important for inside corners. After you have selected the covering material make a template out of brown paper. This is used as a guide as to where to make your cuts in the material as well as giving you an opportunity to practice how to cover your project. 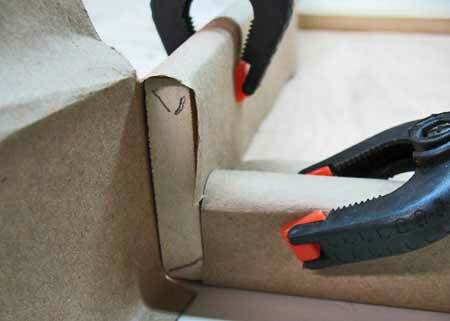 The template should not be glued in place, it can be held with light duty plastic clamps. Photos 40 through 64 offer step by step information on covering your trunk. Determine how you will cover and attach the front and lid. You will be using outer material to conceal the inside holes. This will involve covering, apply a hinge, tightening it, and then continuing to cover. 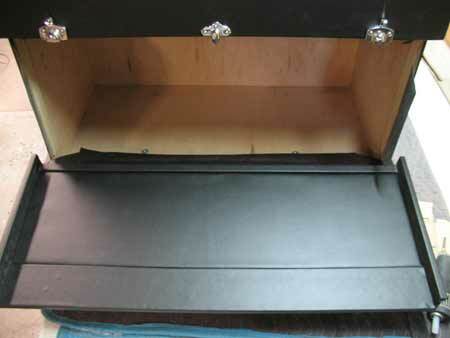 You may need to enlist a helper for attaching such pieces like the front panel and the lid. Photo 40 — Brown paper is used to make a template around the front panel. Small plastic clamps hold it in place. The template helps you decide where to make transitions between the outer covering and your choice for inner covering detail. Photo 41 — A benefit of making the template helps resolve how certain details are handled. Here the template is folded into the inside edges and held by clamps. 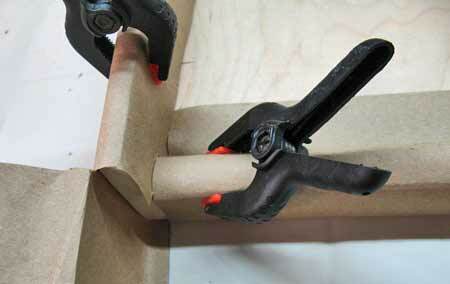 This helps resolve your method for folding and gluing the outer material. Photo 42 — The covering around the outer edge is fine, but the bottom edge is more complicated. Cut the material so that the seam is to the inside (furthest away from the weather). Photo 43 — Choose your cutting instruments carefully. Here angled scissors found at a flea market (probably medical surplus) allows fine cuts in tight corners. Exacto brand knifes offer pointed and curved shape blades. Here a carpet cutter handle and blade can cut into inside edges quite well, usually in a single pass. 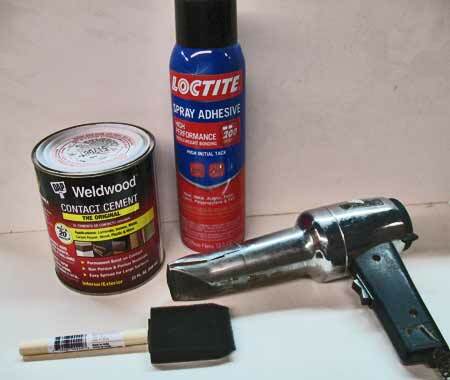 Photo 44 — When it becomes time to apply your outer covering material contact adhesives such as the liquid from Weldwood with disposable foam brushes provide good adhesion, but you must follow the instructions (incuding temperature requirements) carefully. Multiple coats may be necessary. Not all spray adhesives are alike. The Loctrite #200 provides a nice mist spray which allows a uniform coat of adhesive. Spray adhesive onto both the material and the wood. We tried a couple other products from Loctite (#100 and #300) which sprayed in a stream which left bumps and ridges in the material, which you want to avoid. As with any chemical sprays, be sure to use a respirator. When stretching or forming the material around corners, a hot air gun comes in handy. Photo 45 — Here the lid is sized with the cover material and cut to size for the sides and upper and lower edges. 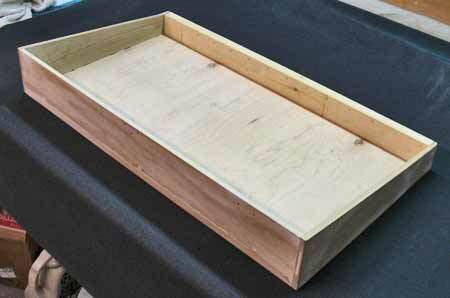 While the template you made can be used as a guide, suggest leaving extra material to be cut as you go. Of course it is better to have too much than to have too little. The template was employed primnarily as a learning guide, not as an absolute pattern for the final material. Photo 46 — The material is marked with a straight edge and cut to the corner. Photo 47 — These plastic pry bars are great tools to form the material into inside corners. A popsicle stick could be used as an alternative. These tools can leave a sharp depression line in the material which makes it easier to make a straight cut. Photo 48 — Covering your project should be done in logical steps. The front panel was covered on the outside, but stopped short to allow you to fasten the hardware. 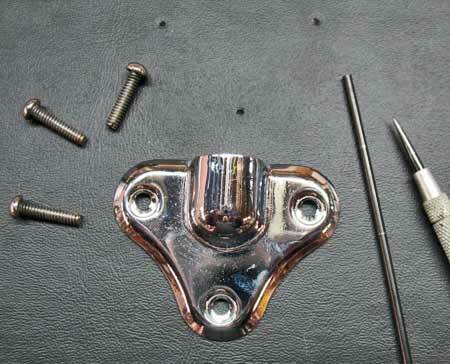 Here the back side of the top locking hasps and alignment pin can be accessed to tighten the threaded rivets. Afterwards the material can be glued in place, concealing the holes. 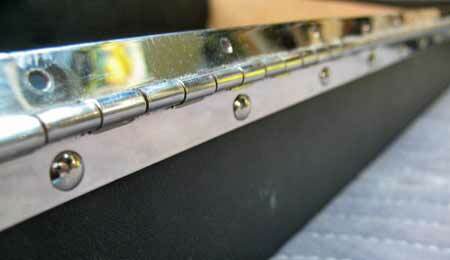 Photo 49 — Partial view of the polished stainless steel piano hinge fastened using truss head threaded rivets. The truss head is almost identical to the lead coated steel original nail used on our reference trunk's piano hinges. Photo 50 — Locating holes for the threaded inserts is as simple as using a narrow center punch or other thin pointed "awl" type tool. Once a hole is located, it can be widened from the front. Photo 51 — The threaded inserts revealed, another problem is clearly shown, the thin edge of a hasp and other hardware could cut into the material. This could be a problem over time. Photo 52 — To prevent the hasp from cutting through the cover material, we created a thin vinyl "gasket" to separate the hasp from the cover. 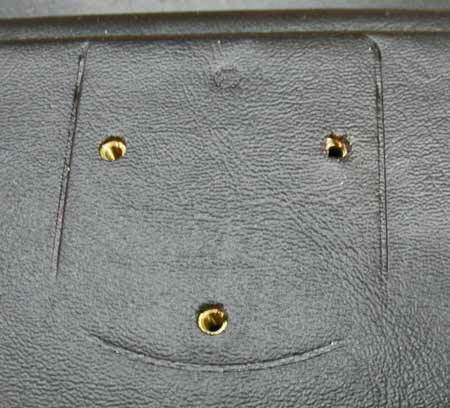 Photo 53 — Similar to the hasp hardware, the alignment pin may need shims under it. Here two shims were needed. As a practical matter, if you can't find black vinyl sheet, you can always use a Sharpee brand marker to color the edge of the shim so it's not noticeable. Photo 54 — Front view of the alignment hardware on the front panel. The mating dowel end would be on the front of the lid. 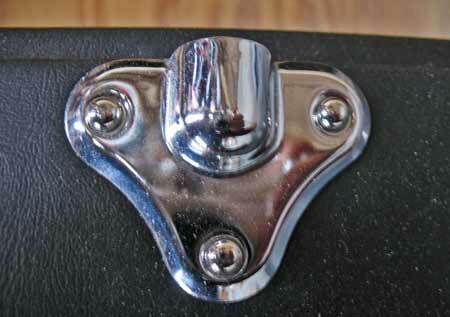 This was fastened using round head threaded rivets. Truss head versions would not sit into the depression well, but the round head fits nicely. Photo 55 — Necessity is the mother of invention. A design flaw noted during this project was the ability to easily lift the lid. 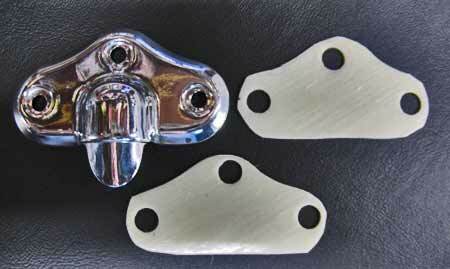 Rather than add a separate piece of hardware, the locking hasps were modified. Here some brass flat stock was formed into a "finger" hook, sanded, and plated before attaching to the lid with small wood screws. 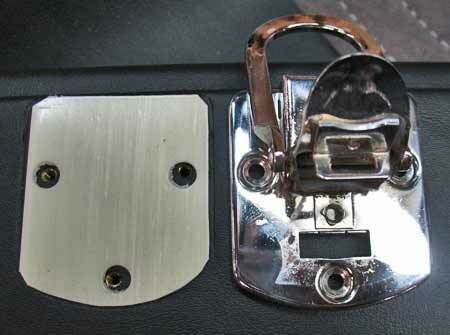 The upper hasp piece was notched to accept the hook. 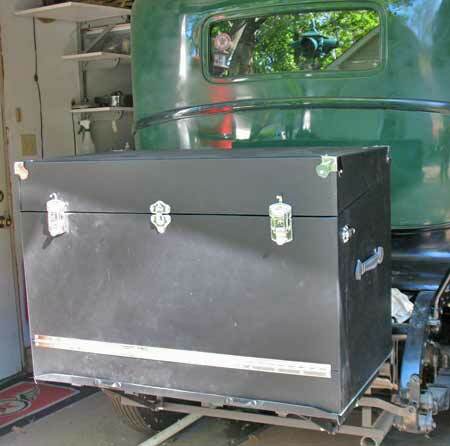 Photo 56 — The main body of the trunk is fitted with one piece of material, starting from the rear, wrapping around one side, along the front and down the other side to the rear. There is only a small piece along the front that needs this, but it avoids a seam that would have to be covered. Photo 57 — The main body of the trunk has been covered from a single piece. Starting at the front, it is glued and smoothed out, and then each side is glued, one at a time. This job requires more than two hands, so you will need an assistant to help pull the material around the sides and ending at the back. Photo 58 — The main body flipped over revealing the back side. 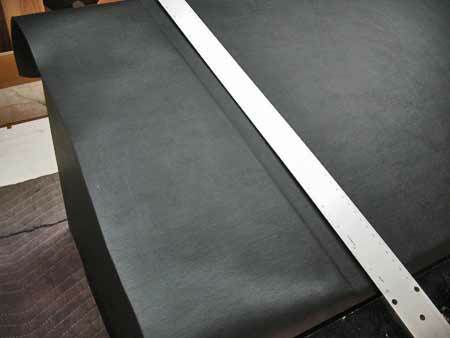 Here a straight edge is used to mark the seam that will be cut. A second short piece will be fitted between the two vertical seams. These two seams will later be covered with polished aluminum. Photo 59 — After the main body of the trunk is covered, now comes one of the most critical steps, cutting and gluing the inside edges. This is where practice on scrap wood and patience will pay off. You've come a long way and don't want to ruin it now. Take your time warming the material using the heat gun and pulling the material over the edges. We suggest gluing one edge at a time as shown. 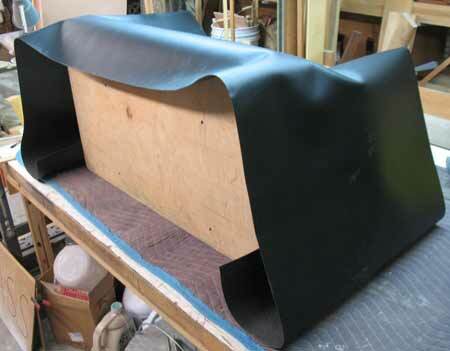 Photo 60 — Photo 60 â€“ Gluing diagram of gluing of the material around inside edges, black representing the outside vinyl or leather and green is the inside. Suggest pulling the material over the top edge and gluing the edge #1 first. If you try to glue all the edges at once, the material when coming in contact with the glue on surface #2 may prevent the material from getting tucked into the corner. This is where those plastic tools in Photo 47 will be most beneficial. After you have a crisp inside corner, apply glue to surface #2. Once the material is firmly in place then continue on to edge #3. Edge #4 the inside covering is shown as a reference. Photo 61 — View of the inside of the front panel. The excess material on the second lip was intentional knowing it will be covered. Photo 62 — We finish off the inside of the front panel with a thin panel covered on the exposed side. It can be held in place with a few daps of silicone adhesive so that it can be easily removed if necessary. The back side doesn't have to be covered in full, just enough to pull the material over the edges. Use of miter corners will ensure a nice crisp edge when placed into the opening. It is details like this that will make you project trunk take on a nice professional appearance. Photo 63 — Next we turn to the inside of the trunk. Just as was done with the outer covering material, size and cut carefully. Since the inside material is so thin, suggest doing overlapping seams in the inside corners. That way no wood will show through. These seams will be visible to be sure to get a good, straight cut. If your covering has a pattern be sure the pattern aligns correctly where the seams overlap. Photo 64 — Cut the inside covering with miter cuts. Glue the covering into the corners being careful not to tear the covering. Photo 65 — Decorative nails can vary from vendor to vendor. The one on the left is slightly smaller and may be the right one for your project for uses such as nailing leather trim. 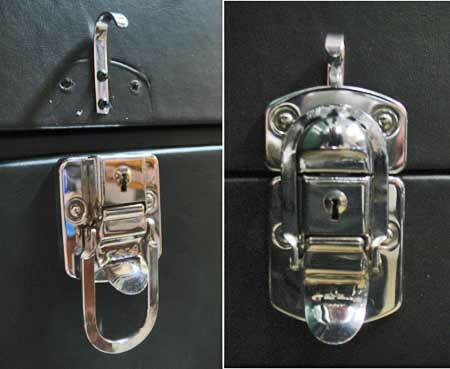 This project trunk used the one on the right for applying the corner hardware. Base — Two pieces; one large piece of material with seams to the back and a second small piece applied between the seams. To be symmetrical, two vertical seams were strategically placed in the rear. Two polished metal strips will hide each seam. This is a perfect application of the dome nails offered by Frank Chervan to adhere the strips. After the front of the base is covered, apply the piano hinge using the threaded rivets and then after the one row is populated and tightened, continue to cover the holes accessed to the threaded rivets. Typically, you will use interior and exterior covering material to cover over those holes. Front panel — One piece with seams on the inside edges of the hardwood. It was planned to use a separate thin wood (luan) precovered panel to insert between the hardwood edges to make a clean look (Photos 15, 61 & 62 show this technique). 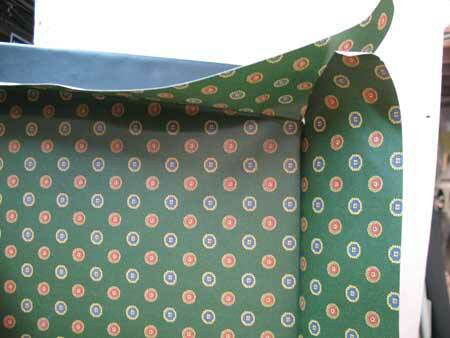 Lid — One piece material with seams at the corners. 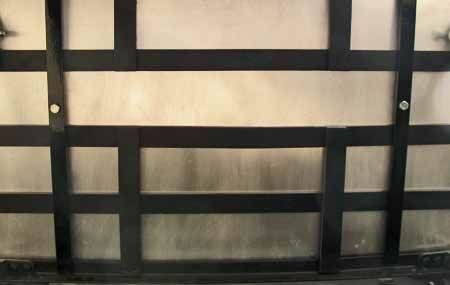 Corner edges can be covered with a leather material or metal angle strips. In this project, aluminum angle was fitted and powder coated flat black to blend into the black covering material. 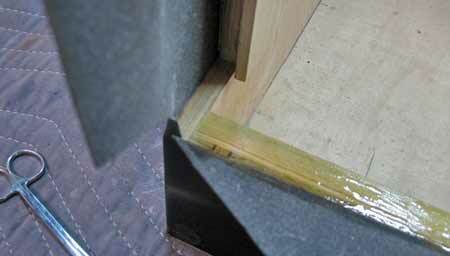 The metal corners selected earlier will cover any other seam areas (Photo 67). 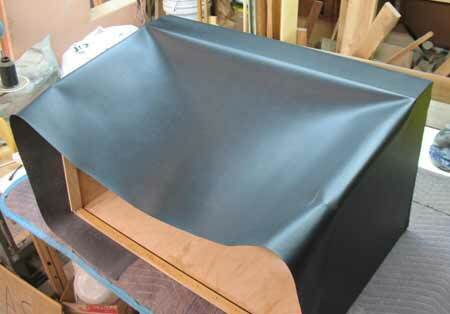 Photo 66 — The outside metal corners are fitted and applied over the outside corners (and seams). 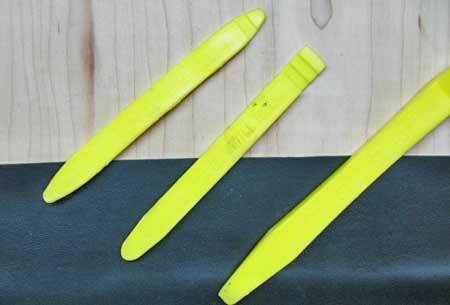 A plastic mallet is used to drive the three nails on the ends. Photo 67 — The last step in this trunk project is applying thin wall angle aluminum that has been cut, fitted, drilled for small nails, and powder coated flat black for both the front and rear corners. These were the corners on the lid that had a seam exposed. The flat black color makes them blend into the material and they are barely visible. We left the small nail heads in the short rear angle piece unpainted for the photo to make their location easier for you to see. We hand painted later. Note that these corner protectors are fitted right up to the metal corner and small amounts of marine sealer like 3M 4200 were placed under the angle to seal out water. Photo 68 — Referring to the blind fasteners in Photos 29 & 30. Here bottom view of 3/16 X 1 inch flat bar that is drilled and bolted into the blind fasteners. The flat bars are perpendicular and sandwich the trunk against rack. Note that a separate piece of unpainted aluminum sheet was nailed onto the bottom. Photo 69 — Test fit of the trunk on the rack. The trunk's width is perfect as it sits between the racks angled edges. Note the aluminum sheet with its folded edge between the trunk and the rack. 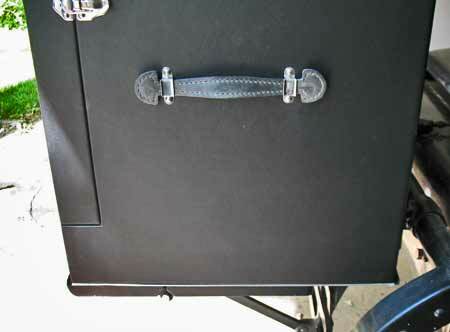 Photo 70 — Overall view of our new trunk fitted onto the rack. Comparing Photo 18 and this one, the distance between the top of the trunk and the body molding is slightly higher, but the overall size of the vehicle easily "absorbs" this height and it fits well on the rack. Conclusion; a project trunk that is show worthy. While not used on this project, leather corners can be formed by immersing the oversized thick leather in near-boiling water for 15 minutes and temporarily stretching & tacking it over a preformed wooden shape and allowed to dry over several days. Frank Chervan offers small nickel head nails perfect for nailing these leather corners. Finally, the inside finish could be either paper or cloth covering. The green and pattern print selected for this trunk is of the 1930's style and the colors were chosen to compliment the exterior and interior colors. When mounting the trunk to the car an aluminum plate is added to the underside of the trunk. This is a simple period correct method to provide protection against road dirt, insects, water, etc. from penetrating the underside of the trunk. Another material that could have been used is tin. It has folded edges to provide a crisp appearance to the outside edge. It is nailed on to the bottom using small 1/2 inch long upholstery nails along the edges and corners. You fit the plate by simply centering it on the bottom. The edges should fit snuggly to the side of the trunk. The design you follow will be critical to how your project will turn out. Examine how the use of hard wood pieces may compliment or interfere with other hardware. This is why we recommend #2 below. Purchase all hasp, hinge and decorative hardware ahead of time and include their actual dimensions and placement into your design. Purchase the covering material (or at least samples) and have it on hand when finalizing your design. 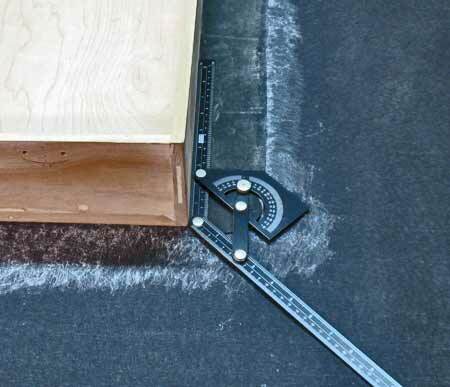 The thickness of the material will likely dictate the final dimensions and spaces or gaps between mating surfaces. Purchase enough to cover your project trunk. 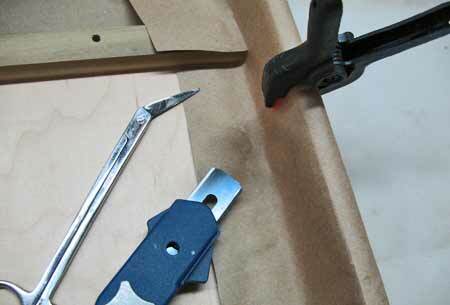 Use brown paper to make practice coverings. Fill in all recessed screw heads and seams with Kwik-Poly and sand smooth. Use a quality wood sealer before applying contact adhesive. Stainless Steel hinges, metal trim, and threaded rivets can be polished to provide a high luster long-lasting appearance. Consider having other hardware plated to perfectly match each other. Finish variations between vendors may warrant plating hasps and other hardware. Save the inside covering for last as it will cover some of the threaded rivet's holes.